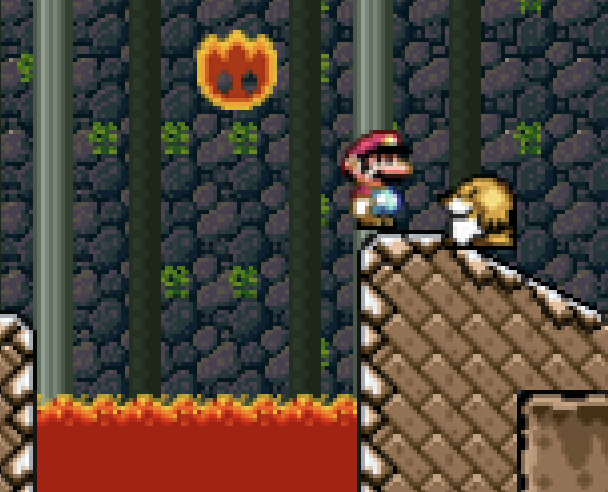 Description: After that mayhem, Mario visits a Castle in the mines filled with lava. The aesthetic of the entire level looks amazing! The mud climbing also is a cool concept that fits the cave castle hybrid idea. Overall, great level! decent variations of challenges, so great job on that part. However, there needs to be more consistency in terms of tiling because some slopes don't function properly and you left a couple of cut-offs through the entire level. i really liked playing this, nice thematic and the level looked pretty good, the challenges were placed nicely and consistent, they werent anything too complex, but still fun as you kept varying varying them. the starcoins added a nice touch to the gameplay, making this REALLY good. you do seem to have a few flaws with tiling though, as at certain bits the mud at the top looked off, you forgot to fill in tiles, making it look cut off and well... you could fall through some slopes, the feather also made skipping through this level possible in some ways, so the design missed quite a bit of the detailing. last note: the background not scrolling felt extrmeely odd and tainted the gameplay. good design, detailing is missing a lot.